My posts have become sporadic because I have an ambivalent relationship with this blog. It was my first foray into social media specifically to promote myself/my work, and I’m not a self promoter. After much delay I’m now on Instagram (@patludwigquilts — follow me!! ), and I’m finding that to be much more appealing. I just put up the pictures. Still trying to figure out the whole hashtag bit, but having fun with it. But I do like writing about the creative process, and whenever I get a notification that someone signed on to follow this blog, I feel guilty about letting it languish. In my last post quite awhile ago I said I’d be back to show and tell another project from last summer’s creative retreat. So here it is, and I’m a little rusty, so bear with me. 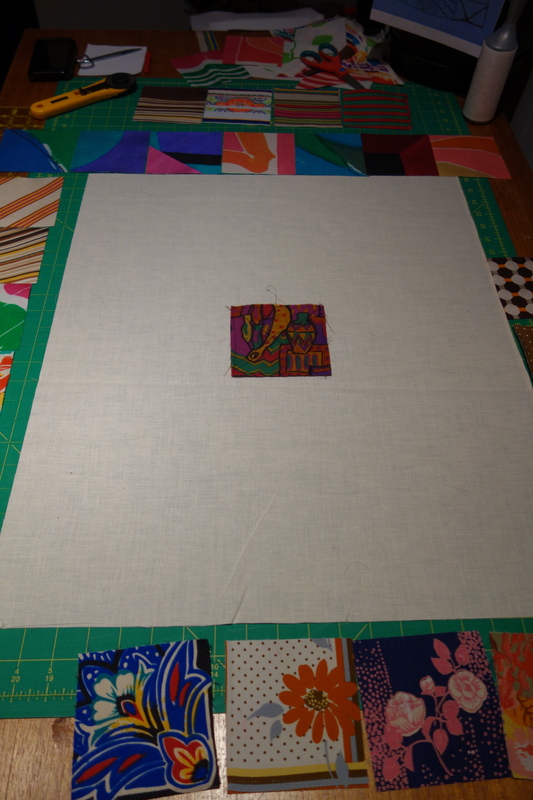 When I made the quilt above, which was sometime in 2014, I churned out more of the small squares than ended up getting used. My general practice is to stow extra pieces and bits that I like, and I liked these, so I set them aside. 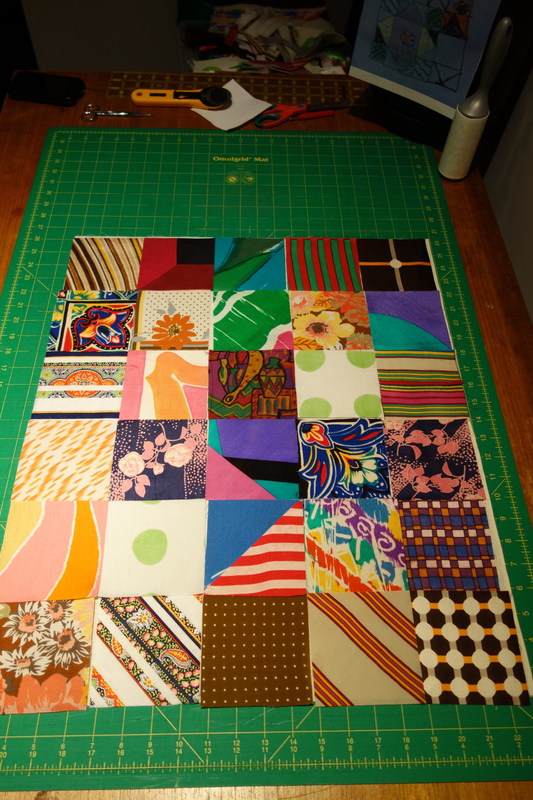 happened, I sewed those remaining squares (in center above) somewhat haphazardly together. 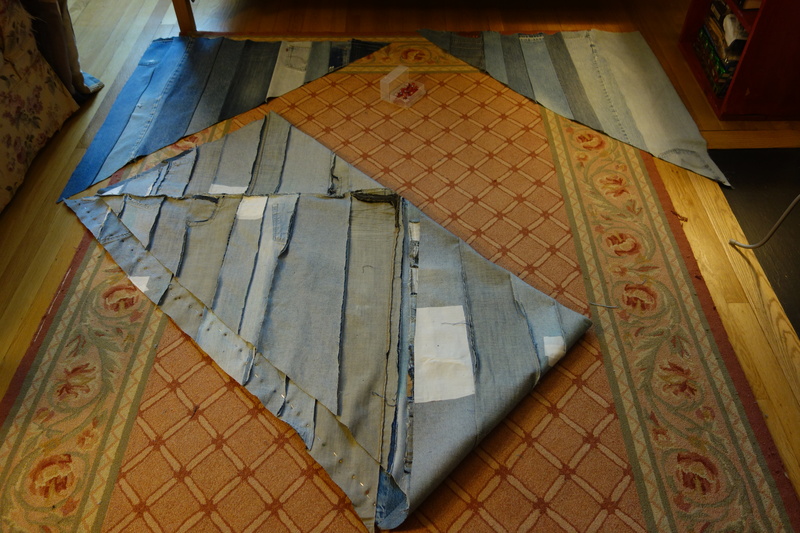 I added that jeans bit (pressed inner leg seams) as a border for the center square. 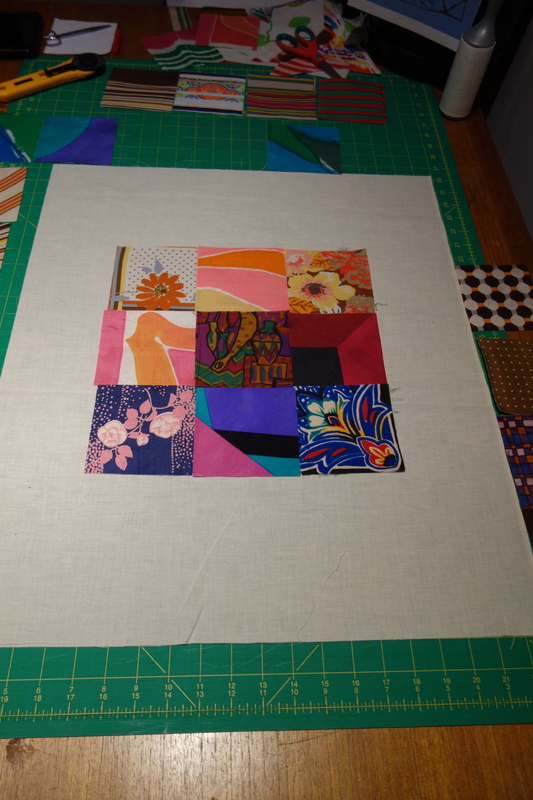 Then started a basic strip border with other scraps. Meanwhile, I’d been going to look at art with my very painterly friend Chuck, who is tremendously inspiring to me. He paints on his jeans … sometimes just splatter as a result of being near paint and sometimes to play with representation, like the bold rectangle above. 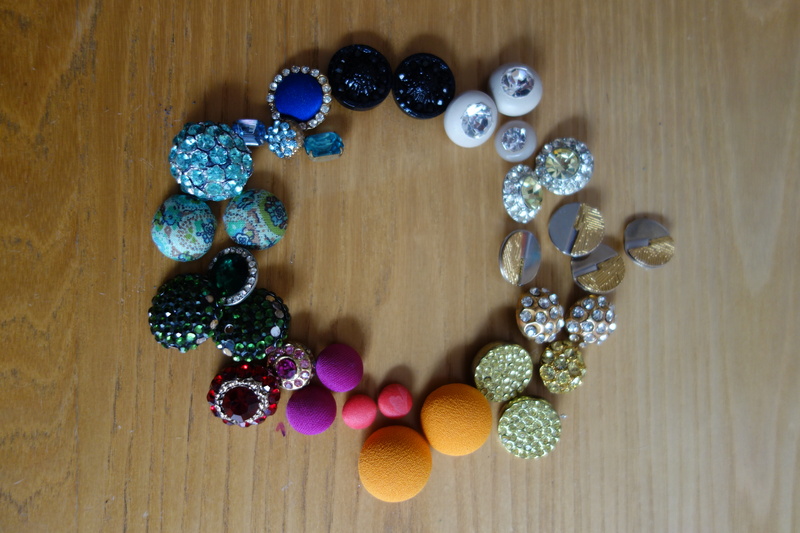 He’d given me quite a few of these amazing pieces and initially I had no idea what to do with them. I find sometimes I just have to start cutting. After making some pretty traditional strip rows, I wanted to draw the indigo of the jeans out, so I added short strip rows of painted jeans. Then there were the bold geometetrics on some of the legs, which stood as design elements themselves. As an aside, Chuck sometimes gives painting workshops with jeans in Washington Square Park. The results no one wants have been passed to me. with all of these chargers ready to be taken apart and turned into something new. … so I’ll leave you with this one, which features Inspector Buddy. 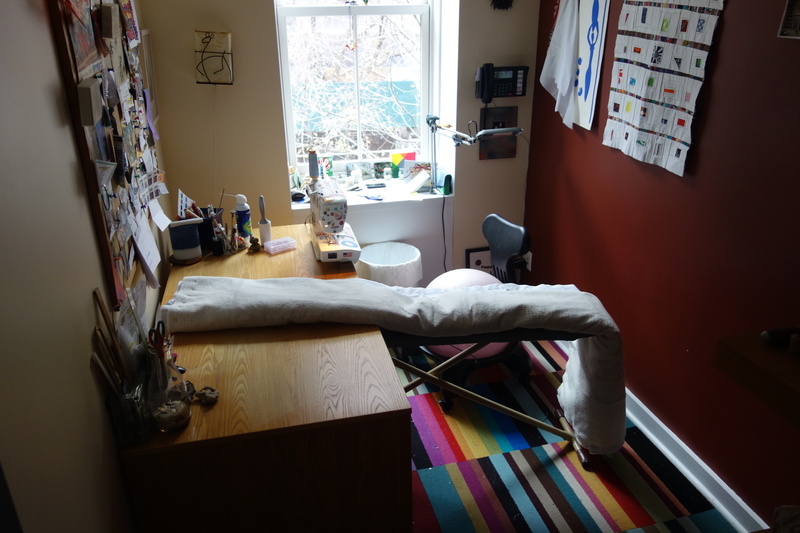 When we left off, I was in creative retreat so I could work in an unhurried, peaceful environment. I had no particular plans, just a lot of materials. as a four point star. With this inspiration, I found myself joining together as many as I could. It was not especially easy or fun. I wanted the watch pockets and rivets in there for texture and variation, but this upped the difficulty ante, so that needle heartbreak waited over every pass. Modest Machine gamely grinded over the varying levels of fabric density like a mower over a dry rocky lawn. Eventually a payoff came in visual impact as they multiplied. 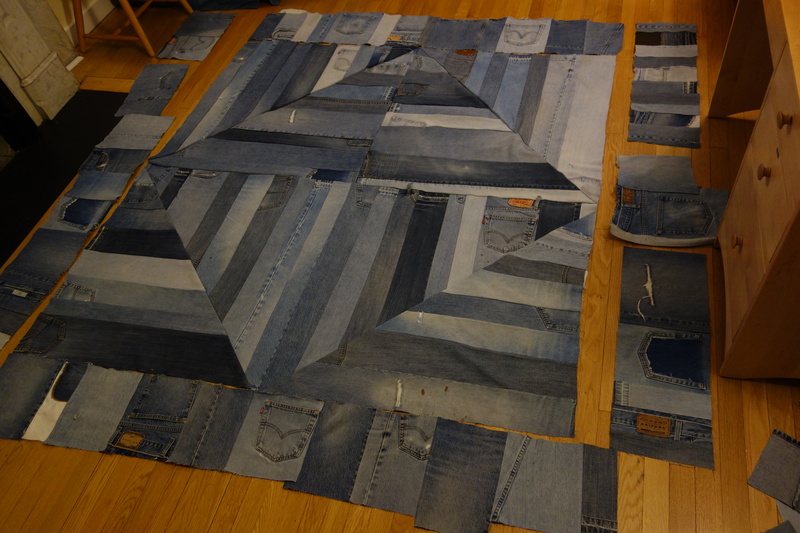 Since the jeans and pockets were different sizes, the resulting star squares went from small to large. 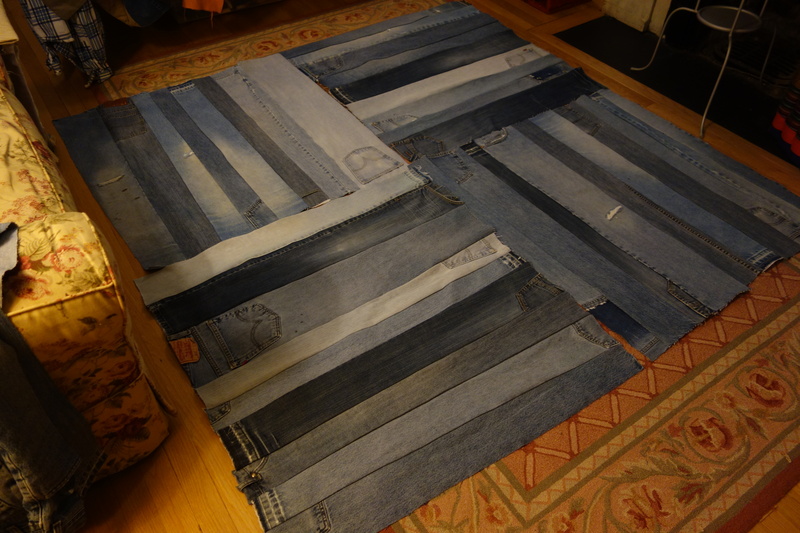 Dipping into my denim stash, I gave each a wide border, adding tonal variation with different fades. Staggered, the borders gave a sense of movement to the stars, but I chose to collapse them into an overall square. I wanted to use as much of the original source material as possible. Lots of lining remained because of the emphasis on denim thus far. 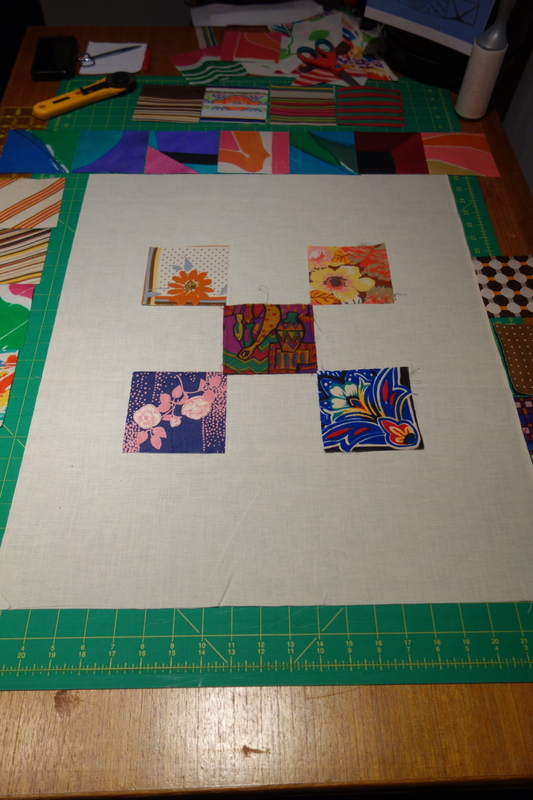 Usually the back of a quilt is a simple muslim or sheet … why not piece all the pocket scraps together? 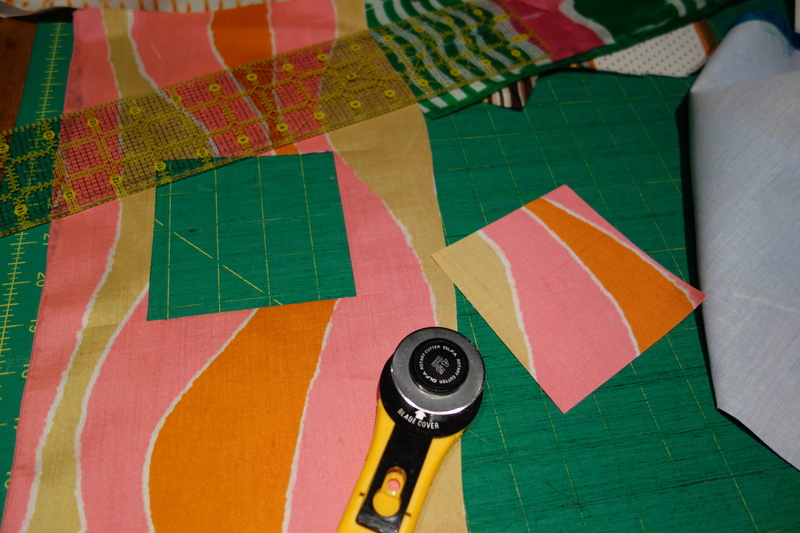 It would be smooth sailing for my little machine; the fabric was all the same weight. If I had to classify it I’d call it a throw. When not thrown it folds up rather tidily. 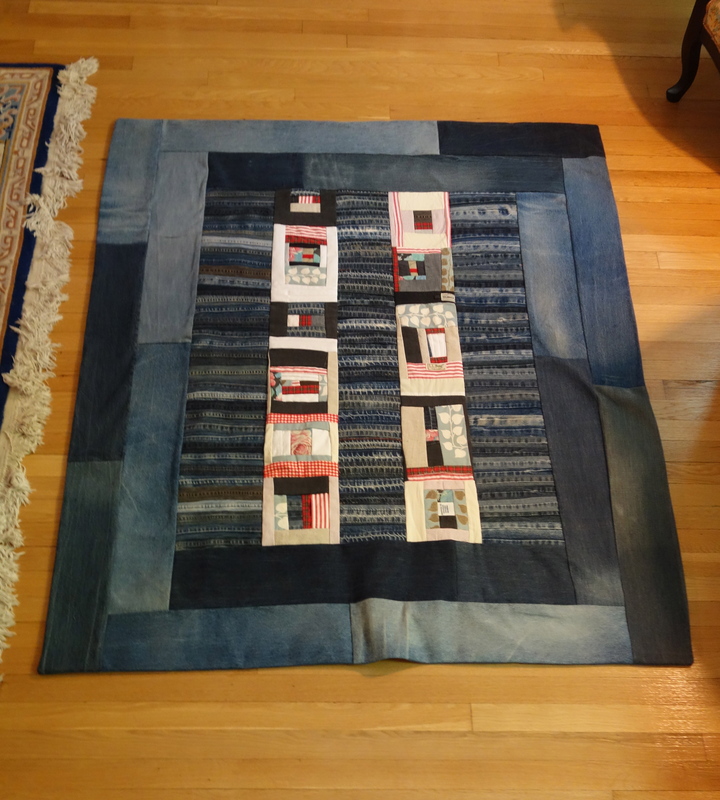 There is one more quilt I finished while on my peaceful retreat. I’ll write about that next but will leave you with a summer sunset for now. A highlight of my summer was about 17 days (but who’s counting) at my lakeside weekend home in New Jersey. My husband joined me on the weekends, but the rest of the time was my own, and I used it as a creative retreat. I had two cats with me, family nearby, some wonderful neighbors, and nothing but the cycling days and nights to fill as I wished. It was bliss. I have been cutting up jeans, khaki’s, cargo shorts and more for 10 years. In this time, my house has been blighted with clothes moths. Enter Container Store. Two items in my materials seemed to float to the top. My younger son (known as Chuck) recently castoff a pair of cargo shorts. My painterly friend Chuck gave me a canvas remnant scored with an island of red paint. These became my starting points. Using a seam ripper, I completely took apart the shorts, section by section. Preparing the fabric is observational and contemplative. Handling it I note its surface feel, weight, mobility. With each change in geometry and line I imagine new arrangements, and fabrics to enhance the bright red island. 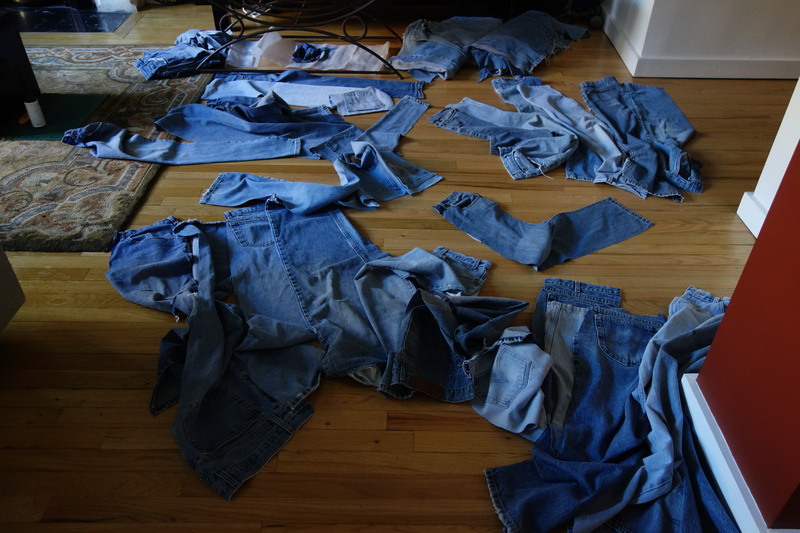 It takes most of the first day to take the shorts apart. Waistband, cargo pockets, zipper fly, hems, and belt loops all give way to my seam ripper, lint roll, and iron. These were well worn shorts. I’m not sure why they stopped returning value to my Chuck, but for me this new form is tremendously pleasing. I love its furry softness and the rippling gradations in the fade. The rabbit munching in the grass every day probably put me in mind of a red clover print in my stash, luckily in one of the containers I brought along. These were from a pair of jeans (pocket lining) I wore in the long long ago, before children. Turns out this is why I saved them. At some point in my process there’s a shift from taking apart to putting together. In this case it was when I noticed the pocket flaps had clipped corners. 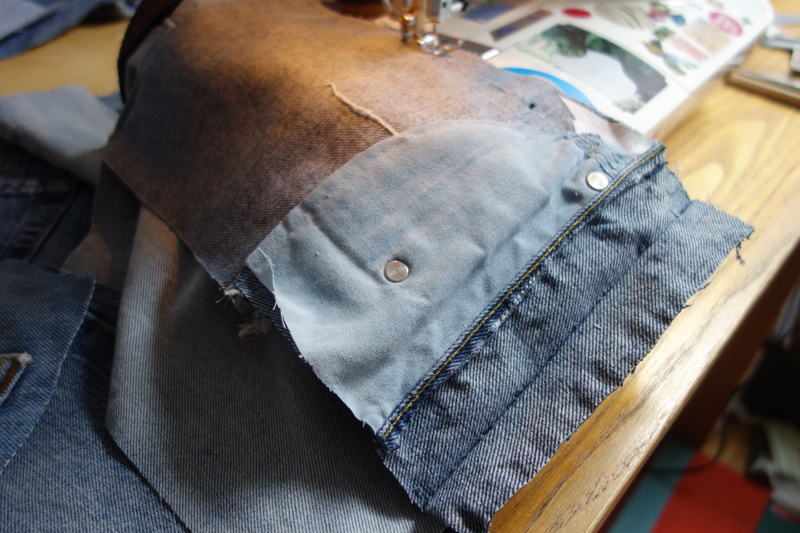 Modest Machine roared to life to attach pocket lining to create 90 degree angles. I’m enjoying now how they look like old fashioned photo mounts. Buddy checked frequently for surface feel. 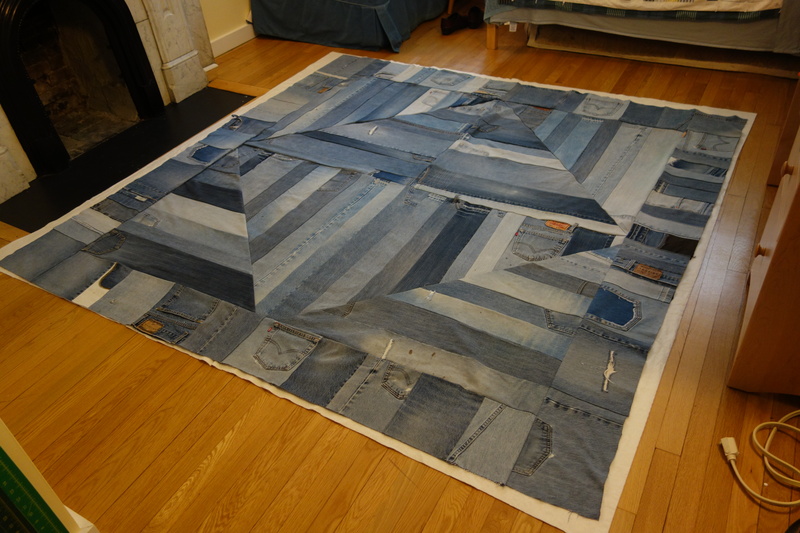 Until it was done (about 22 hours, but who’s counting), and as close to square as I’ve ever come with a quilt.The border includes a jeans leg where Chuck painted a blue rectangle. That’s Chuck Squared. Backing is an old sheet. The fill, as always, 100% cotton batting, as this is a small quilt/blanket/throw. Coming very soon a post on the project that came on the heels of this one. Let me know what you think in the comments, and here’s your bonus shot for reading to the end! But it’s not just about me. Sally Kay who is graciously hosting, creates unique jewelry designs in gold and semi precious stones, and Studio E Downtown crafts collage cards inspired by postage stamps. Three individuals creating unique designs in New York City. Crochet webbing for a beach chair? Then Gretchen from Texas found me in the wild world of Etsy. 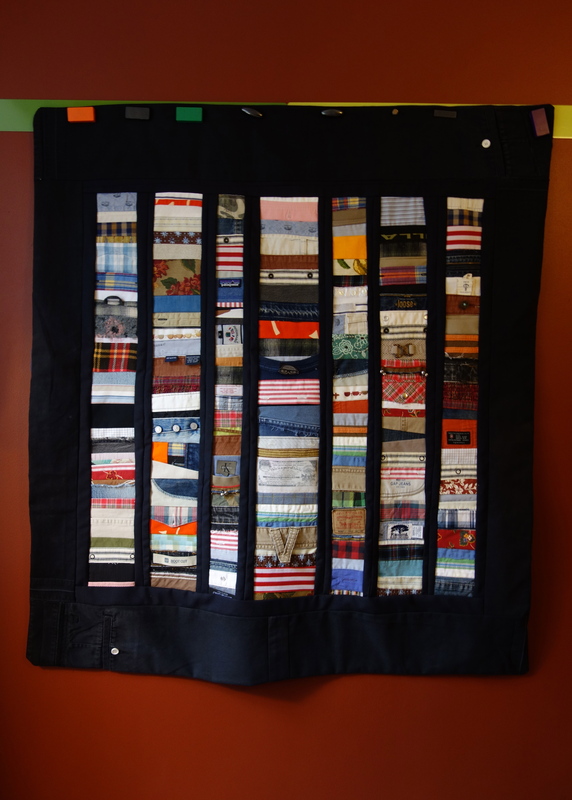 She had saved her sons’ jeans and wanted to turn them into quilts. After a vetting chat, she sent me a box packed with about 35 pair. The first set, from her oldest son, ranged in size from 4/5 years to men’s 36/34. So I set my t-shirts aside and devoted myself to ripping out jeans seams. She wrote her son’s initials, CHC, on the waistbands. In our chat Gretchen said to “focus on the imperfections.” This excellent advice became my mantra as I chose what to draw attention to…. and Matisse cut outs began dancing through my head. which was to be queen size. I created a border surround with the biggest legs to highlight the center design. In spite of Buddy’s assistance, figuring out that center design was the toughest part. This bit of Mom and Dad buttoned together nicely could stand on its own as a little accent pillow. and on the whole, I think it turned out well. I really would like to know. You can comment (click on the number to the right of the date, above) if you like. Or, share with one or two friends you think might enjoy it. If you REALLY REALLY like it, post on your preferred social media. In any case, thank you for reading to the end! As summer filtered away into deepest August, Rod from Carson City, Nevada decided to do something about a lingering idea. 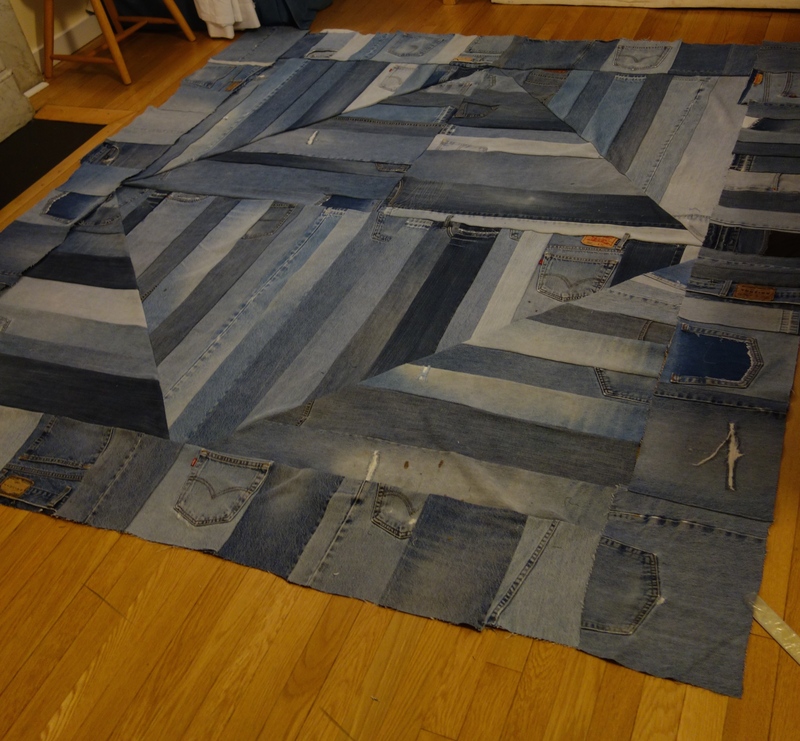 His used jeans pile had grown to 15 after going through his right knee at least as many times and he had been searching for someone to, in his words, “assemble them into a quilt versus discarding them.” Cue the vast and wonderful interwebs, which led him to my email. And so it was that come fall, I opened a box to find multiple Levi’s (size 34-32), Lee, Kirkland (the Costco brand – thanks Lori! ), GAP (relaxed fit), and Joseph Abboud jeans. Rod’s jeans were all retired around the same level of wear (right knee out of most, left in some), some with dark brown spot stains (Rod guessed paint, or maybe blood? He’s a hunter), all neatly folded. The charge at this juncture: pattern ideas for Rod choose from. This beginning stage of a project is always the most fun for my smallest household residents. and I wondered if this quilt style would work in this setting. 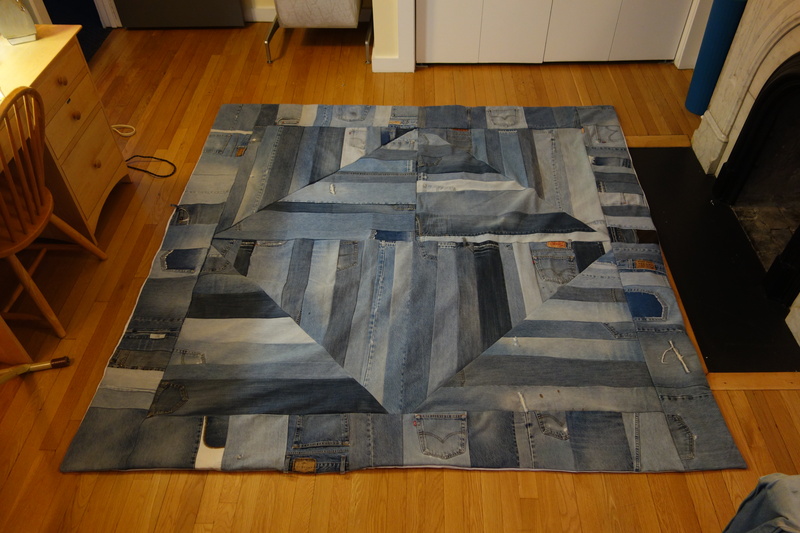 After checking with Rod (and marveling yet again at the trust people place in strangers), it was a go for my first Denim Diamond in the Square. At least the math was relatively easy. I went for the longest strips given the 32″ inseam. 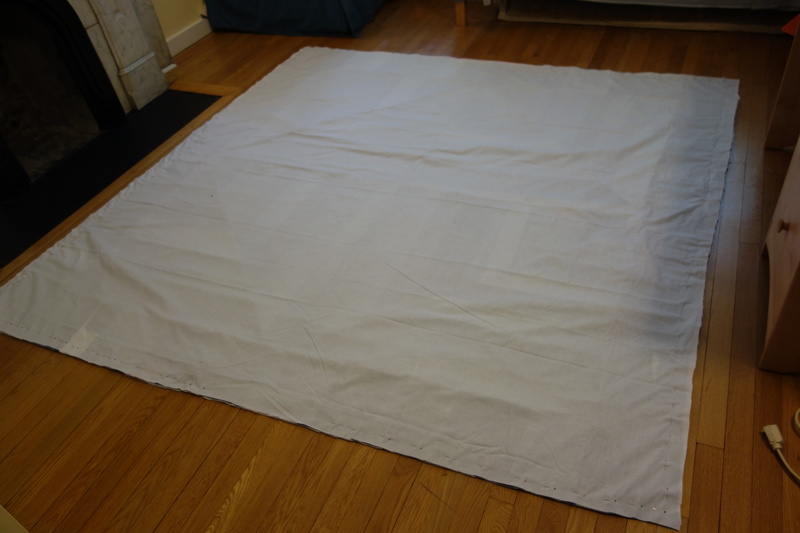 Placket-narrow wouldn’t work here, but 3-5 inch widths seemed about right. 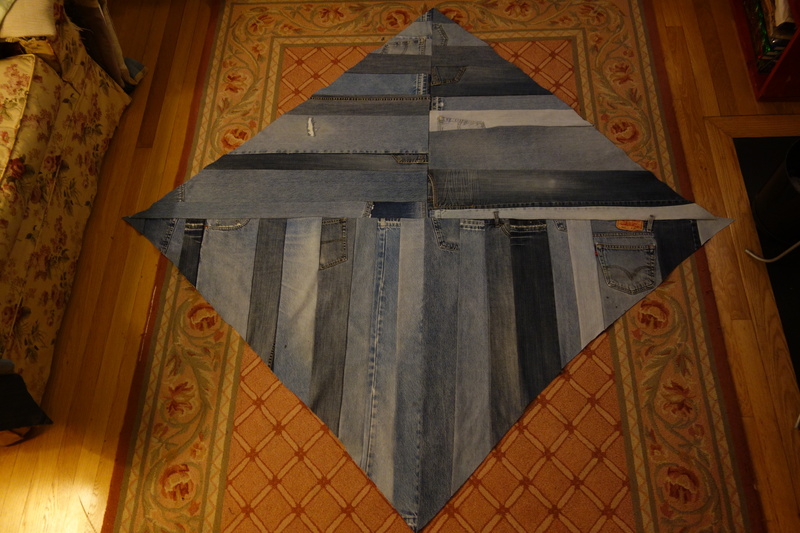 I cut sections for fade, wear, stain spots, and pockets until there were enough for four quadrants. As the whole grows in size, it pays to carefully fold it up at each step both to keep it straight and facilitate feeding through Modest Machine. My workspace isn’t big enough to lay out a project this size, so I walk back and forth, project in hands, from my college son’s vacant room to my workspace. Unfortunately for my knees, this tedious work is best not interrupted because the concentration and resulting work quality might not return in matching levels. So I keep at it until all sides are done. 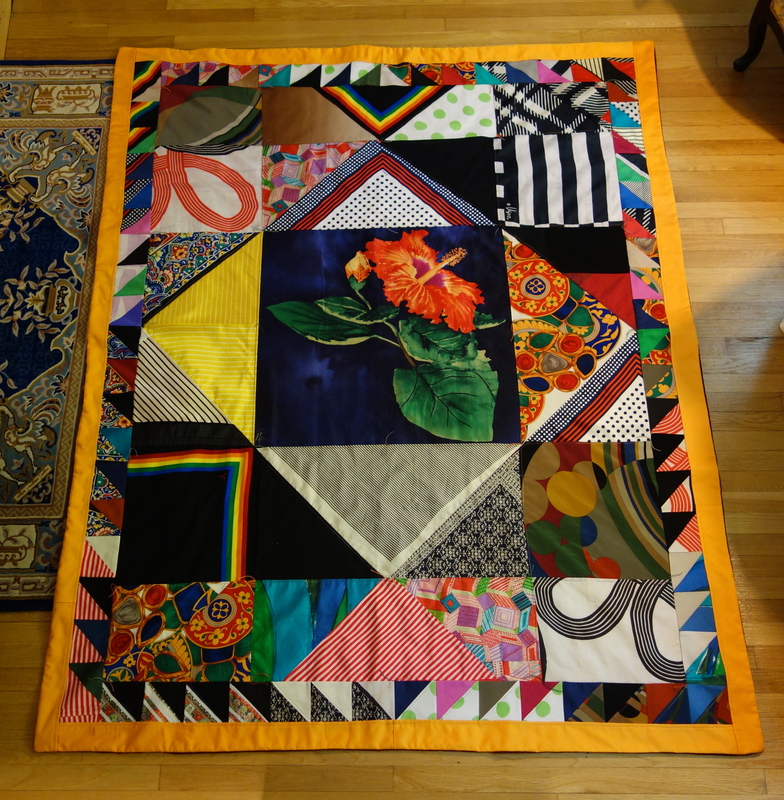 For everyone who asks me how long a quilt takes: sewing these eight triangles together took about four hours. 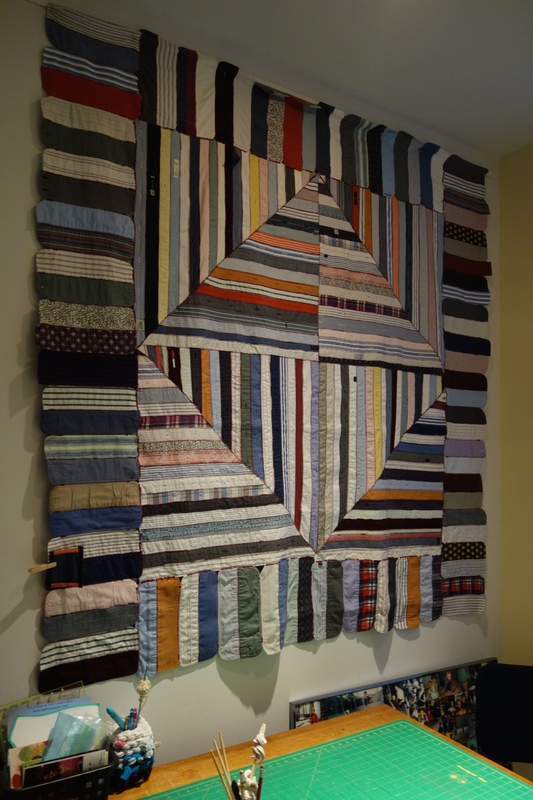 Quilt folkways generally call for a border around a design, so it’s time to confer with Rod. He agrees with my recommendation of a simple “strip” border, and so I paw through the pieces that remain. This turns out to be a good way to deploy the decorative potential of all those jeans pockets. And it’s back to Modest Machine for sewing twice all the way around. I’m feeling kind of just-shoot-me-now at this point. ….and with this view I appreciate it much more, and the work it represents. I hope Rod from Carson City is enjoying its use, and that you enjoyed reading about its creation. Thanks for reading to the end. If you want to be sure to see more of my projects, scroll down and hit the Sign Me Up! button to subscribe, and when I publish it will come to your email automatically. What Can You do with …. 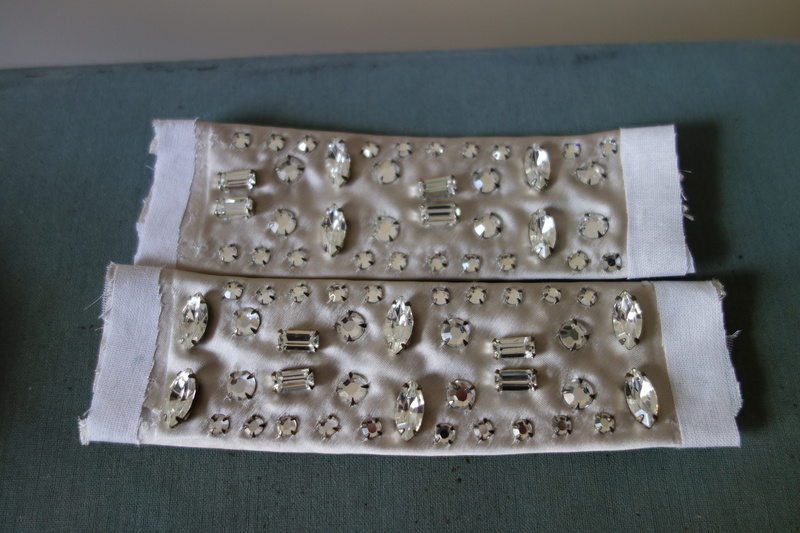 Rhinestone Buttons? Linda came back to me around this time last year with an armful of stuffed plastic bags and a twinkle in her eye. 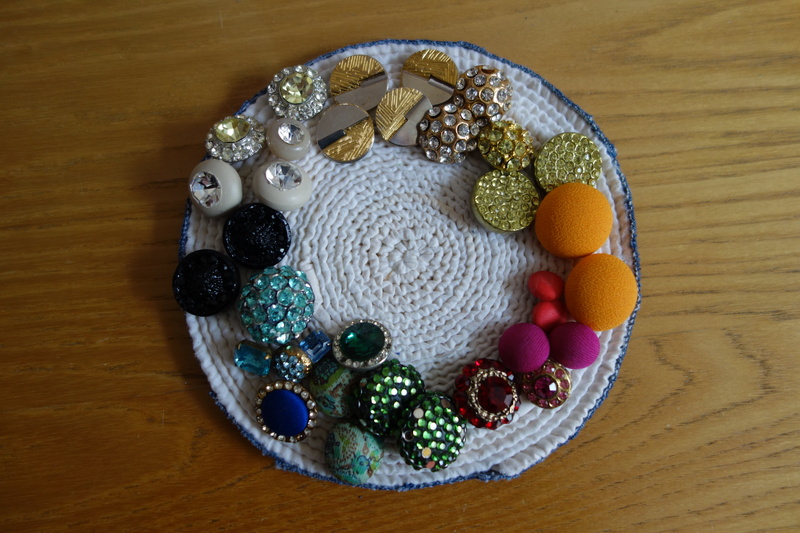 She had an idea: a wall hanging using her mother’s old scarves and rhinestone buttons. How could this be done? Twist around the rod? 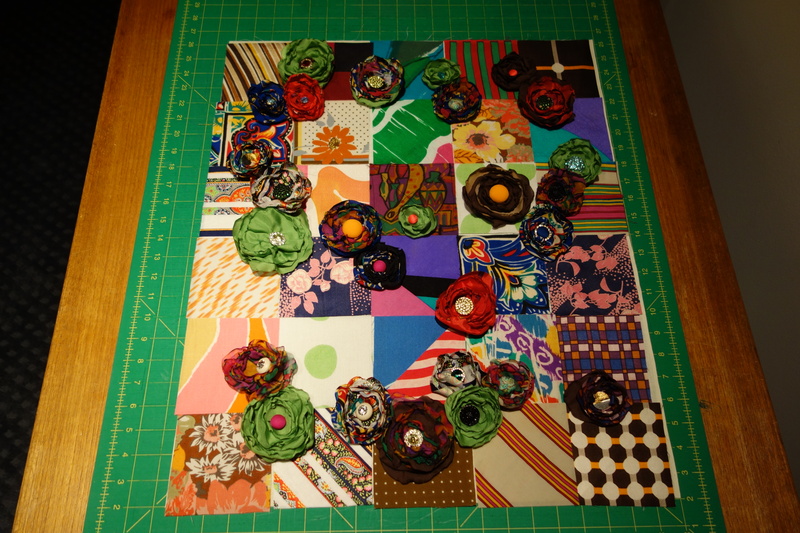 And best of all, she knew how she wanted to apply the buttons …as the center of fabric flowers! The mission was clear, I just had to figure out a way to do it. I won’t show you the how, because it involved flame and I don’t want anyone to start a fire on account of my shenanigans. If you’re so inclined, after doing a little googling, you could find a tutorial, too. Now for the floral arrangement. Big bouquet? A smattering here and there? Best of all she was happy with the final product and bargain price given the work involved. I haven’t made fabric flowers since then. Looking at the finished piece now, I think I like the border the best. There are just so many ways to vary the entire composition. 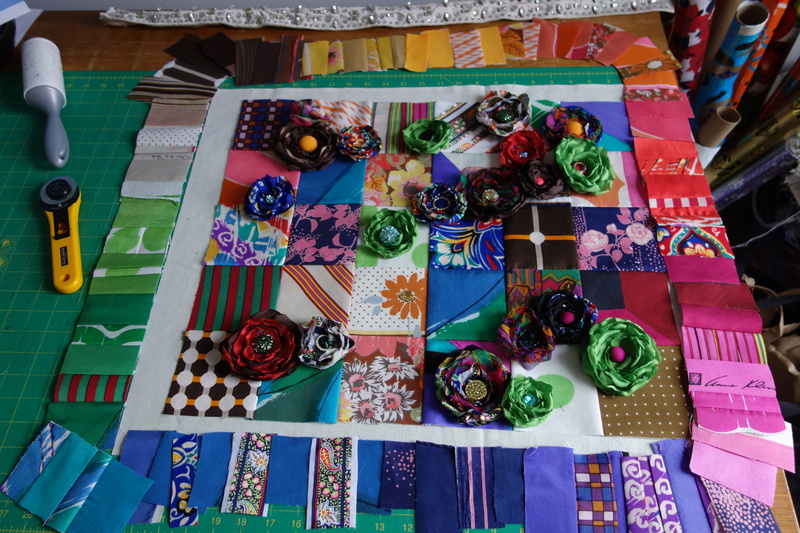 What a riot of color to remember a woman who loved her scarves, her garden, her clothes, and colorful designs! 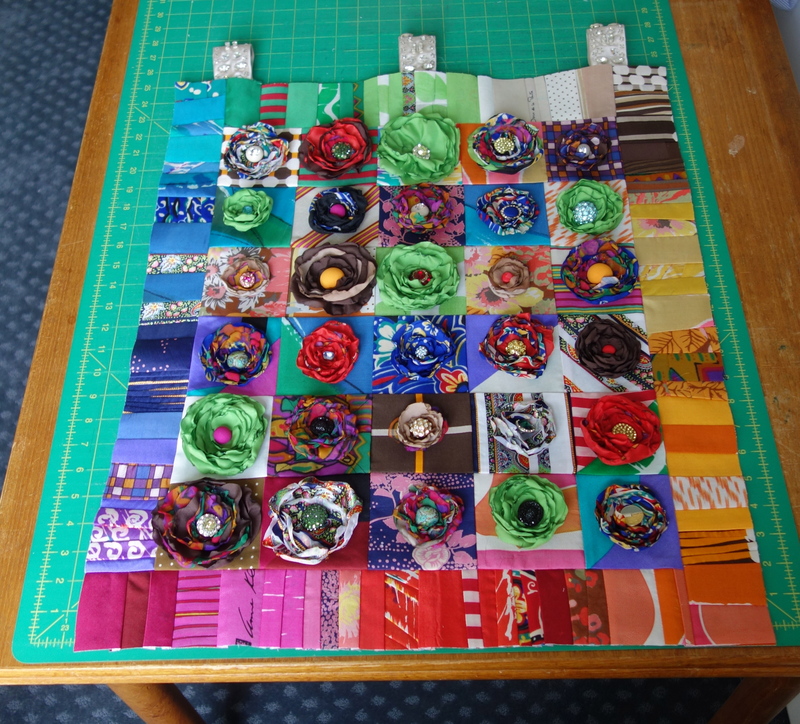 It has occurred to me time and again over the last many months that I haven’t posted anything quilty since before I put up that “most inspiring blogger” patch (thanks again Tall Tales!). These pics are mostly for my followers, who signed up, I presume, because they wanted to see more of my creative process. Thank you for following me! Here are some quick pics of what I’ve been doing since the last peep. I’m not sure which one to write about yet. Why don’t you let me know which one you’d like to see and read more about? Please comment here or email me at patwig63@gmail.com. And Happy Summer! Playing with clothing remnants. Click for a closer look. Flowers made by melting edges of poly scarves over a candle flame. The client wanted flowers, so after googling, I adapted a burning method. Do NOT try this at home! 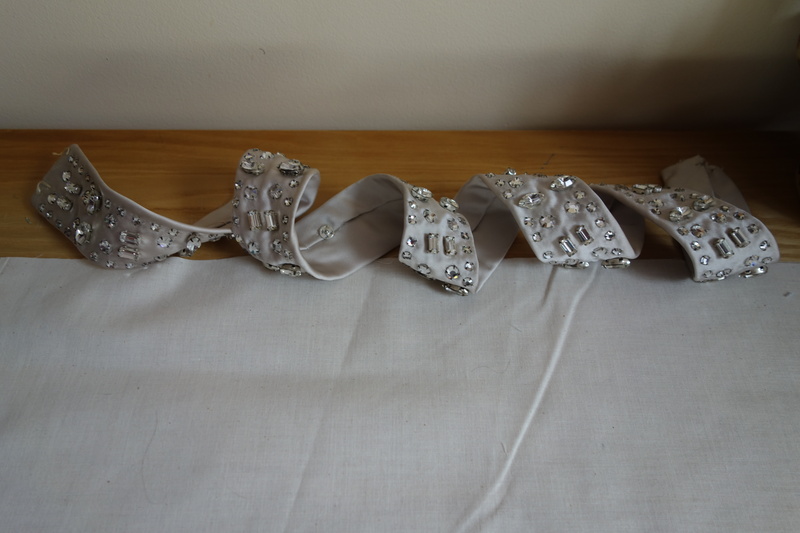 My latest commission took about 3 months to make, from scarves, a skirt and curtains. Sometimes lovely things seem to appear from nowhere … as this weekend, when I was nominated for the Very Inspiring Blogger Award by a fellow quilter, Tall Tales From Chiconia. Thank you for your kind words Tall Tales! Apparently once one receives this honor, there are things you must do, in addition to simply being inspiring in the blogosphere. It’s a little bit like all those copy and paste status thingys people put on Facebook. Well, I’ll play, ’cause I get to display this cool award sticker. First, you nominate other blogs that inspire you! This is the spreading the love part. Herewith, in no particular order ….